Smart textiles are an example. 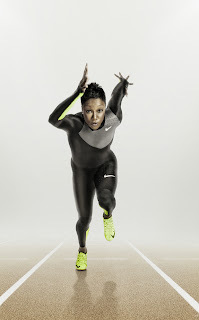 The Adidas miCoach Elite System was included within Adidas’s Olympic Performance Sports Bra. It has also been introduced to football to help with coaching and game monitoring. For this, the miCoach Elite System includes a small data cell that fits in a protective pocket located within the back of a player’s base layer, between the shoulder blades. Connected by a series of electrodes and sensors woven into the fabric of the base layer, the cell wirelessly transmits more than 200 data records per second from each player to a central computer which is instantaneously displayed in a series of simplified insights and results on the coach’s tablet or iPad enabling the coach to monitor the work load of an individual player by measuring every move, heartbeat and step, compare one athlete with another, or view the whole team, to gain a complete picture of the game both physically and physiologically. Three-dimensional CAD software is used to help develop the design for sportswear. It is used to create custom fit models, build life-like digital clothing samples, and adjust these based on virtual fit. Users provide the software with the digital pattern, the type of material with fabric values (such as stretch, weight, etc.) and the measurements and shape of the fit model. The software will accurately create the sample. The digital sample of the garment can then be seen draped on a 3D virtual fit model. 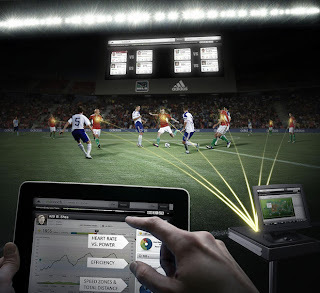 Where a sports animation capability is included, the virtual garment can be analyzed on the virtual model whilst it is undertaking sports such as soccer, jogging, cycling, ice skating, etc. The software can actually show a sample-in-motion that allows for a virtual review of the design, fit, athletic movement and artwork placement in advance of the actual garment being cut and sewn, whilst images and videos can be shared with customers and clients before any physical sample is made.